In Model Cars > Show & Tell and Toys > Toy Soldiers > Show & Tell. Toyrebel wanted to see some Auburn vehicles and I picked this up at the Rose Bowl today. Rose Bowl Flea Market was a bit of a disaster as only about 20% of the dealers showed up due to the forecast of rain. The buyers showed up but there wasn't much to buy. The rain didn't seem to bother the buyers but the sellers were packing their stuff. I did mange to get three buys and this was the first. 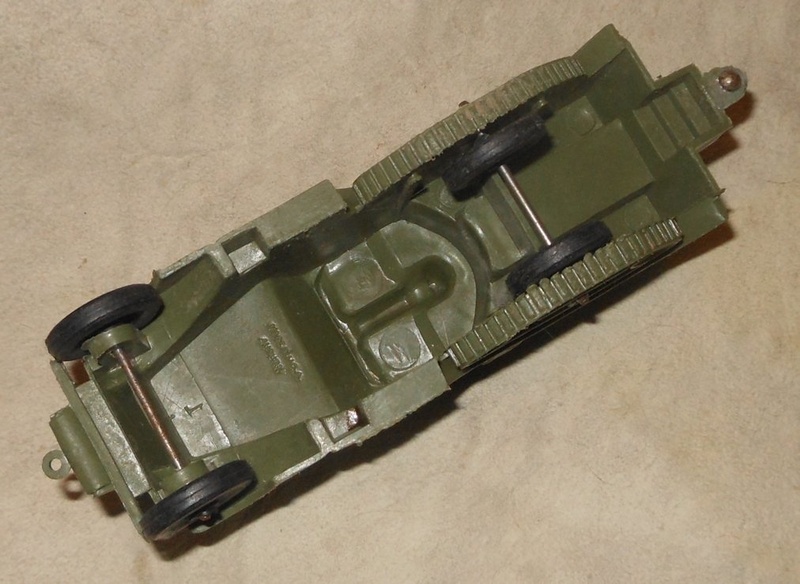 This 6 inch vehicle is made out of plastic instead of rubber. I am thinking this was to compete with the Marx military vehicles which were the same size. If not directly compete they could go with a Marx military set. 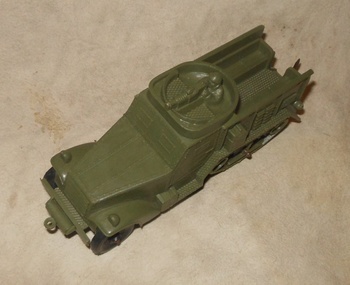 It is based on the US M3 Halftrack of WWII. The only major difference is that the machine gun position is twice as large as it should be. On the actual vehicle it was in pulpit lit structure right side and didn't take up the whole front. Looks like someone added a nail to carry a trailer of some sort. 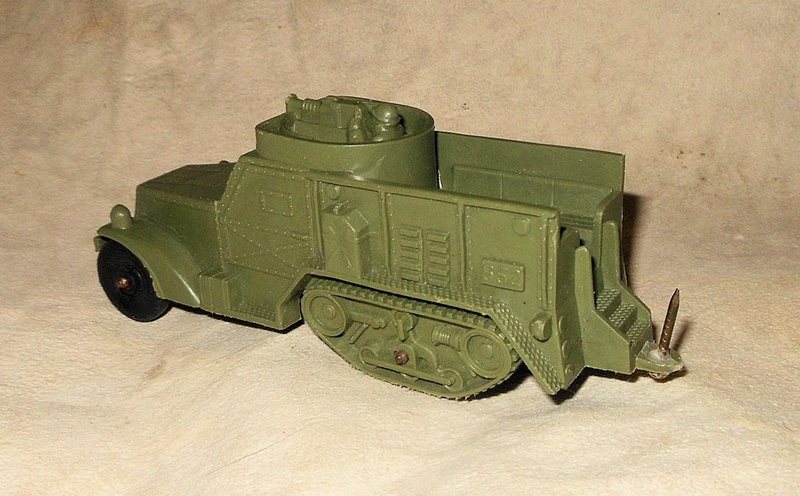 There is a loop in front so the halftrack can be towed as well. Wrapping things up is the bottom view showing the wheels under the tracks so it can roll about. In the meantime as I did not spend my allowance at the Rose Bowl I can go to Long Beach next week. Unusual that it's not the normal rubber. 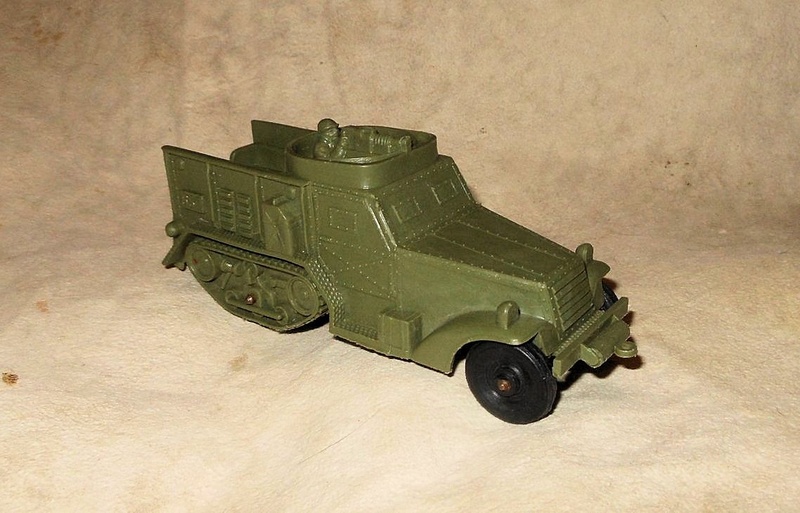 I wonder if they made the tank, jeep/cannon and the canvas covered truck in plastic also. Thank you very much Newfld. Thank you very much Toyrebel. I will check. The tank and truck are rubber. I don't have the jeep or cannon.